The 500 XC-W is one of the most powerful enduro machines of its class. Combining low weight and high displacement, high-tech SOHC 4-stroke technology is the right choice for all who are looking for maximum performance, combined with playful handling. 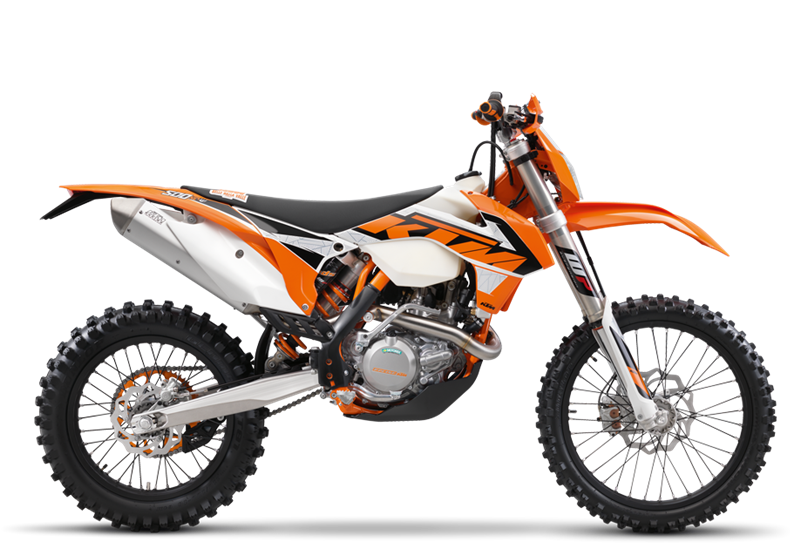 GRAPHICS New graphics with clear lines visually underscore the exacting standards of what KTM deems a true, cutting-edge off-road bike. COOLING SYSTEM The proven integrated KTM cooling system routes the coolant from the cylinder head through the frame triangle directly to the WP aluminum radiators. A radiator fan is standard equipment for the big displacement 500 XC-W.
FRAME The modern frame design of the 500 XC-W, comprising lightweight, high strength, chrome-molybdenum steel section tubes, combines maximum longitudinal stiffness with optimum torsional stiffness. This guarantees easy handling and precise steering behavior, as well as excellent ride stability. It clearly represents the benchmark in terms of weight and stability. Thanks to the frame design and the rear PDS damping system, impacts at the rear wheel are absorbed and dissipated optimally. For 2016 the frame is protected by a new, robust skidplate. SUSPENSION/DAMPING The KTM 500 XC-W is fitted with a new front fork featuring newly designed fork boots with shorter offset, increased trail and a new suspension settings, optimally tuned to weight and engine. In addition, the fork features new fork guards allowing for easier cleaning. At the rear, a PDS shock absorber from WP Suspension works with a direct linkage to the upper side of the swingarm. A wide range of setting options for rebound damping and high- and low-speed compression damping are standard and can be adjusted to suit racing and trail conditions. COUNTER BALANCER In order to balance and smooth engine vibrations, the engine uses a counter balance shaft, which doubles as a water pump drive. STARTER The 500 XC-W is equipped with a kickstarter as well as electric starter as standard. The electric starter is well protected behind the cylinder. TRANSMISSION The proven 6-speed gearbox is distinguished by easy and precise shifting. ENGINE MANAGEMENT SYSTEM The Engine Management System by Keihin with electronic fuel injection via a 42mm throttle body ensures a snappy response and maximum engine performance. An oil-cooled 196 W alternator provides sufficient energy for the fuel injection, lighting and other electrical loads. With an optional map-select switch from the Power Parts program, the EMS can allow the rider to select different engine characteristics. In addition, the optional User-Setting-Tool provides the ability to readout engine data with a laptop and change the ignition and injection mapping with just a few mouse clicks. CYLINDER HEAD A single overhead camshaft activates two titanium intake valves and two steel exhaust valves. The weight-optimized valve train has low friction for improved performance as well as low engine braking action. ENGINE Developed for tough off-road duty, the SOHC engine with 510.4cc is distinguished by an extremely compact design, easy maintenance and excellent durability at a minimal weight. Together with the Keihin EFI system, this provides unrivalled enduro specific performance and rideability. BRAKES High-tech Brembo brakes have always been standard equipment on KTM off-road bikes, and combined with the lightweight Galfer Wave discs, they are the ultimate solution in braking technology. Being the class-leading brakes in off-road, they are unchanged for 2016.